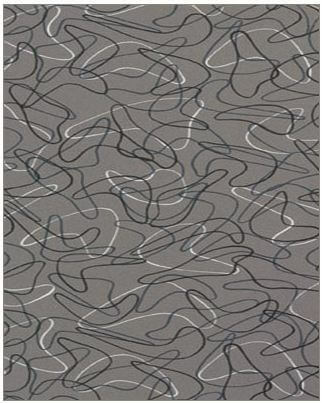 Boomerang laminate from Formica — Of course, metal banding was used to edge laminate countertops. 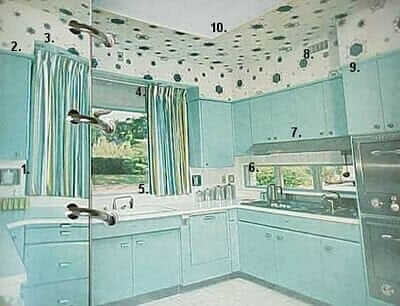 Today, the only “authentic” design available (that I know of) is the classic “Skylark” from Formica. Alas, no more aquamarine or coral directly from Formica via the big box stores — only Charcoal. (Chalk one up for the Greige Nation.) However, you can get “stockpiled” pastels of the discontinued Formica boomerangs from Bars & Booths. The stockpiles cost two-to-four times now — but I understand that vendors like B&B need to make a return on their sunk investment costs to buy and then store this stuff — flat and climate-controlled. B&B also carries special order Wilsonart boomerangs and prewar “cracked ice” patterns. Looking beyond the authentic retro designs, I try to keep track of “retro style” laminates from all the major manufacturers in my Kitchen/Countertops category. For example, I like Formica’s “Dogbone,” and there are some pretty decent “linen looks” right now from a number of makers. Elkay stainless steel sink tops — I first wrote about Elkay Lustertone drainboard sinks in late 2007. 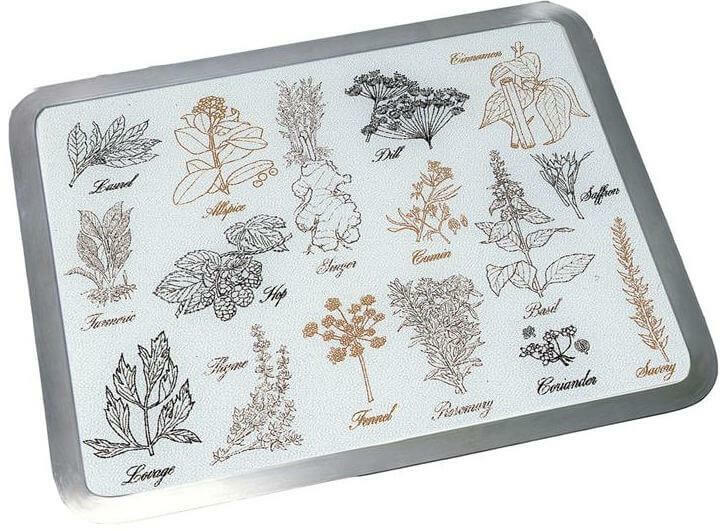 These wonderful products have been around for a long time. If my salvaged 1963 Geneva steel kitchen cabinets had not come with four vintage Kohler cast iron double bowl sinks, I may have gone this Elkay drainboard route. I LOVE the idea that you can plop wet stuff right on the drainboards — and stainless steel is even more serviceable than porcelain, I think. 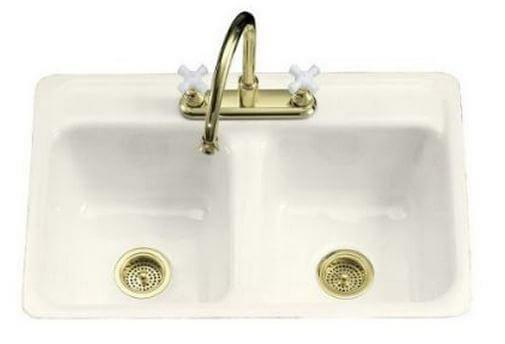 I recently connected with someone in Great Barrington who is installing one of these Elkay Lustertones on vintage Beauty Queen sink base. I think he chose a Custom all-built-in design (like the one at the right.) I’m have been chasing him for a photo of the completed project. See drop-in drainboard sinks here. 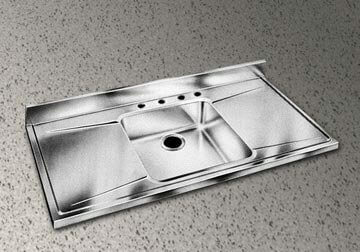 Here is an example of complete “sink top”, other sizes also are available. 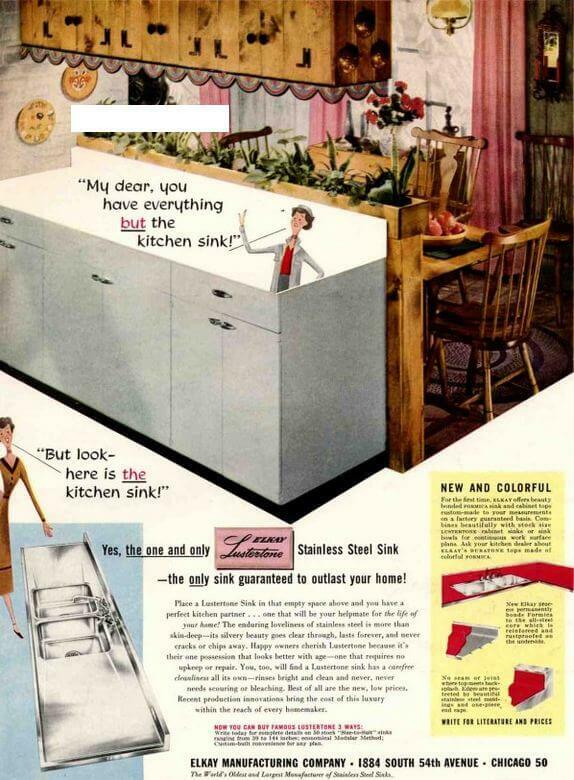 Hudee Rings aka Metal Sink Rims from Vance Industries: … except… the Kohler marketing photo above does not show the stainless steel sink rim, or sink frame — or”hudee ring” — as we call this ubiquitous yet now kinda “forgotten” feature of mid century homes. These are still made by Vance Industries — in business in Illinois since 1949 — in 18 stock sizes or on request, virtually any size. Yes, I am obsessed with Hudee Rings. Read my interview with company CEO Bill Rapp here. 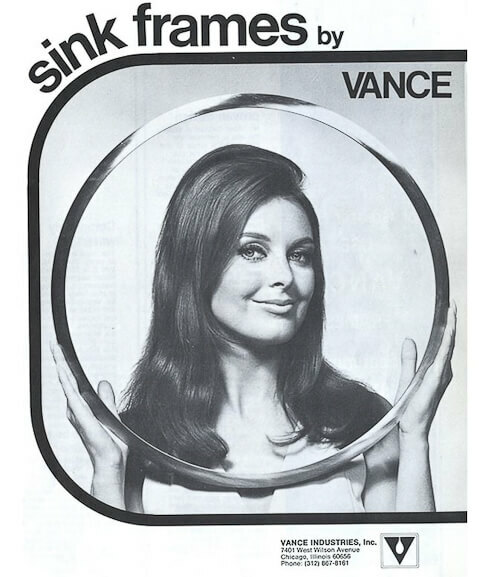 And, get ‘yer hudees here: Vance Industries metal sink rims, lugs and bolts. Built-in, hudee-ringed cutting boards— Vance Industries also still makes those built-in, metal-rimmed cutting boards — Built-In Surface Savers® — that started to proliferate in the 1970s. They have a bunch of styles, pretty impressive. Reader Jon is the intrepid researcher who discovered Vance Industries. I am everlastingly grateful. Jon & Trixi installed “Wild Spice” (above) in their kitchen. Dishmaster kitchen faucet — It’s not just a kitchen faucet — it’s a Dishmaster. Okay — not made by the original company — but made by a nice company in Indiana that bought the tooling and stuff from the original owners in Michigan. 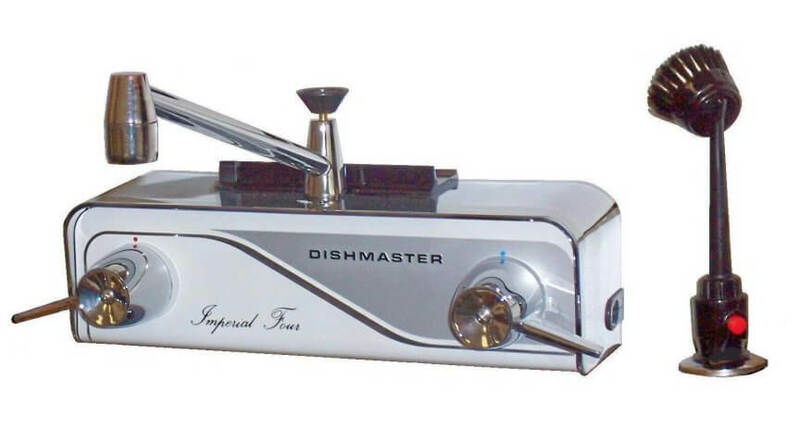 Okay — the large rectangular housing is no longer a honkin’ steel casting (it’s some kind of chromed plastic or composite) — but the Dishmaster still is unparalleled in its authentic retro funkiness. Read about my tour to visit the factory in Indiana…. 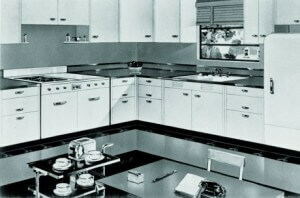 check out all the great Dishmaster history here… and 5 models to choose from here. 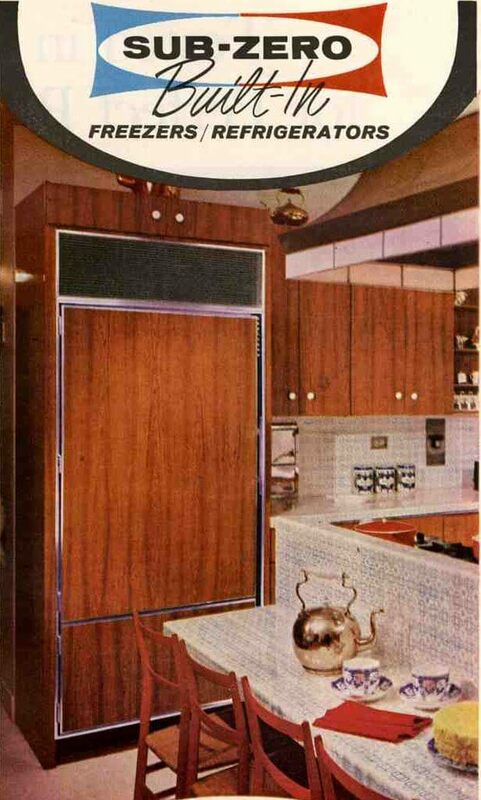 Sub Zero refrigerators — If you order the old style grille for up top… and the “framed” handles… and “appliance white” panels (or your own laminate)… you can get a Sub-Zero today that looks just like the Sub-Zeros back in 1966, the year for this ad (right, and featured larger in my original story). 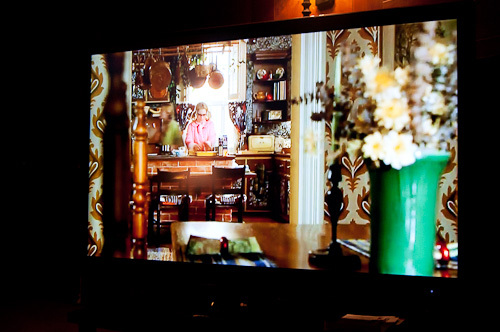 I used this strategy, and installed 42″ white, side-by-side Sub Zero in my “new” 1963 kitchen. Yes, the Sub Zero fridge cost me a lot. But my salvaged cabinets came in at less than $30 a unit after years of hunting. Don’t rain on my splurge parade. Sub Zero’s website. Nutone kitchen exhaust fans — You can still get a Nutone exhaust fan for your kitchen… BUT, you must order the satin chrome housing (visible once installed) as a replacement part. Otherwise you get white plastic or some such. I am told. Tradewind exhaust fans — Universal Metal Industries has been in business in Arizona since 1950. I love the look of their Trade-Wind AF7 exhaust fan, which they say is rated for kitchen use, at 280 cfms. (Check your local codes.) This product has been around A Long Time. My original story. 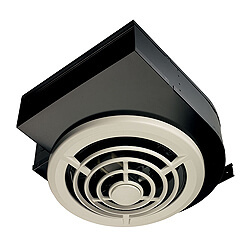 The Trade-Wind website: The AF7 exhaust fan. Wallpaper reproductions — I am the world’s #1 fan of wallpaper for midcentury homes — including in the kitchen. 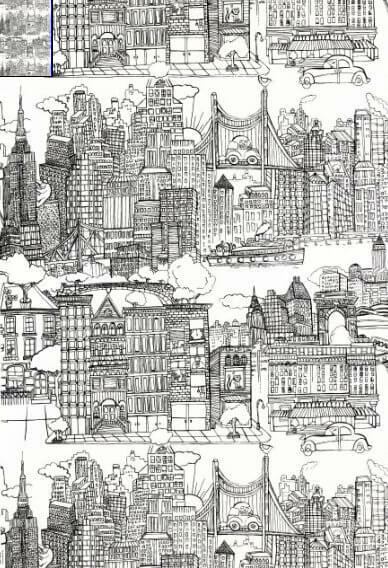 Okay, so the “New York New York” design by Saul Steinberg (of New Yorker fame) for Schumacher may been designed with kitchens, but it seemed appropriate to feature it today. 😉 See my Wallpapers category for other authentic vintage reproductions including from Sanderson, Thibaut and Bradbury & Bradbury (disclosure: a current advertiser). 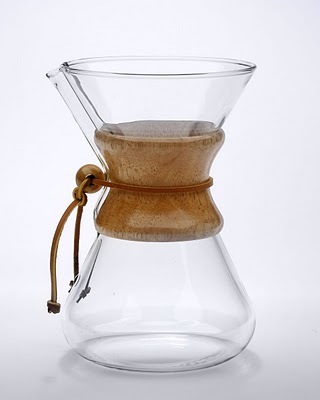 Chemex coffeemaker — I could go on a long riff about pots, pans, silverware, accessories and towels. Some Armstrong VCT is probably the same as it ever was. But I fear this story is already too long, and 13 is an unlucky number. So, we’ll end with Chemex coffeemaker, invented in 1942 and still sold today. A classic – home base in the town right next door to me, Pittsfield, Mass. This blog is ALL ABOUT researching products to help you with renovating, un-renovating, decorating and otherwise loving your mid century home. –> Check out my all my Kitchen product research in my Kitchens category, which now features improved, second level navigation to help you find what you’re looking for, faster. 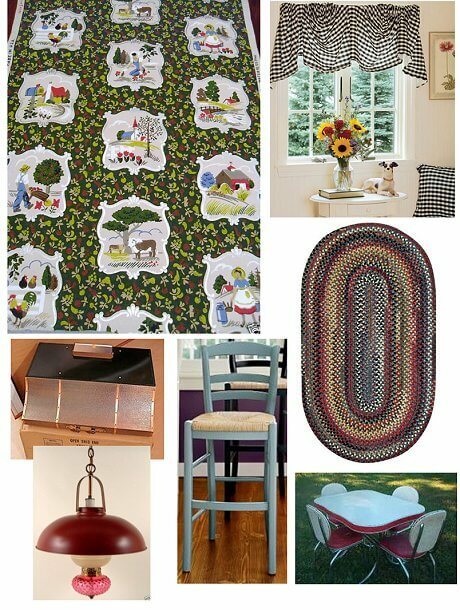 Retro kitchen Flashback design tips – my first! As a kid it was my job to clean the crude out of the Hudee ring on “surface saver”, I am afraid I cannot share your love o’ the ring! I did appreciate that you could take the most scalding hot thing ever and slide it on to the surface with no fear, though. I hear ya. I am told, however, that if it is ratcheted down correctly, el crud should not get beneath. We have had the original 50 year old hudee around our kitchen sink for a number of years now with no problems whatsoever. I adore the drainboard sink but had to make do with an Ikea, it’s poor third cousin 17 times removed, as I spent most of my cash on other things during the reno. And not going with the laminate above was a big mistake, got too hung up on time frames, and then I could have had the drainboard sink. Pout. It’s not on the list, but we have a NUTONE intercom/radio system in our 1958 house. The main console is in our kitchen, and there are speakers to every room in the house (minus the bathrooms) as well as the garage, outside entry, and patio. My hubby bought a Chemex (just like the one pictured) a few years ago. He loves it.